The Distinguished Service Cross (DSC) is awarded to members of the United States Army for extreme gallantry in combat. The DSC is the second highest military award for valor, ranking only below the Medal of Honor. The award was established by President Woodrow Wilson on January 2, 1918 on the recommendation of General Pershing, Commander-in-Chief of the Expeditionary Forces in France. For their actions during World War I, 6,309 awards of the Distinguished Service Cross were made to 6,185 recipients. In addition to the U.S. Army soldiers (including members of the National Guard), 30 Marines serving with units attached to the U.S. Army were also awarded the DSC, as well as 31 sailors (many serving with the Marines in medical positions). In some cases, Marines and Sailors were awarded the Navy Cross for the same action recognized by their DSC. Several dozen Army soldiers, as well as eight Marines and two French Army officers, received two Distinguished Service Crosses. Several pilots of the Army Air Service received multiple DSC awards. Daniel R. Edwards was also awarded the Medal of Honor for a later action. Colonel John H. Parker, the commander of the 102nd Infantry Regiment, 26th Division, was the only ground soldier in World War I to receive four Distinguished Service Crosses. Based on their listed home town in U.S. Army records, 135 Texas soldiers earned the Distinguished Service Cross. Thirty-two were awarded the medal posthumously and their names are proceeded by an asterisk. Their name, rank, unit, date of action, and short citation for each Texan is listed below. See our Google Drives shared drive resource and our list of all Texas senior valor awards (Medal of Honor, Distinguished Service Cross, and Navy Cross). Company B, 3d Supply Train, 3d Division, A.E.F. The Distinguished Service Cross is presented to Robert L Abbott, Corporal, U.S. Army, for extraordinary heroism in action at Chateau- Thierry, France, May 31 to June 4, 1918. Wounded in the hand by a bursting shell, he voluntarily drove a motorcycle, carrying messages and information to and from French and other headquarters. He was without sleep for 36 hours and constantly passed through hostile machine-gun and shell fire. Company K, 353d Infantry Regiment, 89th Division, A.E.F. The Distinguished Service Cross is presented to Harry J. Adams, Sergeant, U.S. Army, for extraordinary heroism in action at Bouillonville, France, September 12-13, 1918. Sergeant Adams followed a retreating German into a house in the town of Bouillonville and, ascertaining that the enemy had entered a dugout, fired the remaining two shots in his pistol through the door and ordered the surrender of the occupants. By his bravery, coolness, and confidence he captured single-handed approximately 300 prisoners, including seven officers. Company G, 360th Infantry Regiment, 90th Division, A.E.F. The Distinguished Service Cross is presented to Paul H. Anderson, Private, U.S. Army, for extraordinary heroism in action near Le Grand Carre Farm, France, November 1, 1918. After being severely wounded early in the combat, Private Anderson went on two missions for his battalion commander which necessitated his passing through heavy machine-gun fire, not mentioning the fact that he had been wounded. Company C, 125th Infantry Regiment, 32d Division, A.E.F. The Distinguished Service Cross is presented to Marcos B. Armijo, Private, U.S. Army, for extraordinary heroism in action north of Mont St. Martin, south of the Vesle River, near Fismes, France, August 5, 1918. While his company was under a heavy barrage fire, Private Armijo was hit by a shell and both his legs blown off. Private Armijo lifted himself up on his elbow and rolled and smoked cigarettes. By this display of nerve he conveyed to his comrades an unconquerable spirit of fearlessness, pluck, and will power. Headquarters Company, 6th Infantry Regiment, 5th Division, A.E.F. The Distinguished Service Cross is presented to Joseph G. Armistead, Corporal, U.S. Army, for extraordinary heroism in action near Thiaucourt, France, September 14, 1918. After his Stokes Mortar had been destroyed by enemy shell fire and the officer in charge severely wounded, Corporal Armistead formed his squad as riflemen and led them forward against a machine-gun nest which was firing on our line from the flank. In attempting this bold feat, Corporal Armistead was killed. 358th Infantry Regiment, 90th Division, A.E.F. The Distinguished Service Cross is presented to Isaac S. Ashburn, Major, U.S. Army, for extraordinary heroism in action near Fey-en-Haye, France, during the attack on the St. Mihiel Salient, September 12, 1918. 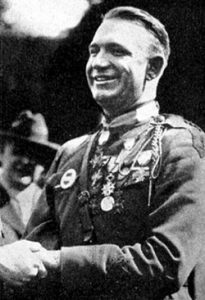 After being practically paralyzed for more than an hour from a wound in the neck, Major Ashburn resumed command of his battalion and continued to lead it with exceptional daring and effect until he was incapacitated by a second wound two days later. 353d Infantry Regiment, 89th Division, A.E.F. The Distinguished Service Cross is presented to Moses D. Atkins, Captain, U.S. Army, for extraordinary heroism in action near St. Mihiel, France, September 12 – 13, 1918. Though he was wounded at the outset of the attack, Captain Atkins continued to lead his company with skill and entire disregard of danger, until during the attack on Thiaucourt when he was wounded a second time so severely that he was unable to proceed. Company A, 9th Machine-Gun Battalion, 3d Division, A.E.F. The Distinguished Service Cross is presented to Clyde Barlow, Private, U.S. Army, for extraordinary heroism in action during action near Cierges, France, October 9, 1918. Private Barlow exposed himself to artillery and direct machine-gun fire while going 300 yards in advance of our front lines to render first aid to a wounded soldier, whom he carried to shelter with the assistance of a comrade. 120th Machine-Gun Battalion, 42d Division, A.E.F. The Distinguished Service Cross is presented to Charles L. Barrow, First Lieutenant, U.S. Army, for Extraordinary heroism in action northeast of Chateau-Thierry, France, July 30 & 31, 1918. Acting as leader of a platoon, First Lieutenant Barrow stimulated his men by his heroic conduct to success until incapacitated by a second wound. 142d Infantry Regiment, 36th Division, A.E.F. The Distinguished Service Cross is presented to Thomas D. Barton, Captain, U.S. Army, for extraordinary heroism in action near St. Etienne, France, October 8 – 10, 1918. Captain Barton advanced his company against a strongly fortified enemy position, and succeeded in capturing the enemy works, together with twenty machine guns and ninety prisoners. After he had lost all his company officers and sustained many casualties in his command, Captain Barton again moved forward through an intense barrage, and established the most advanced position of the first day of the battle. Company D, 359th Infantry Regiment, 90th Division, A.E.F. The Distinguished Service Cross is presented to Glenn A. Bell, Corporal, U.S. Army, for extraordinary heroism in action near Villers- devant-Dun, France, November 2, 1918. Corporal Bell was wounded in the arm by machine-gun fire, but in spite of his injury continued , to lead his squad and assisted in taking several machine-gun nests. 26th Infantry Regiment, 1st Division, A.E.F. The Distinguished Service Cross is presented to Harry L. Bennett, Jr., Captain, U.S. Army, for extraordinary heroism in action at Soissons, France, July 18, 1918. Being in command of a regimental train and having been instructed to deliver medical supplies at all costs to the advance first-aid station, and after all means of transportation had failed, Captain Bennett secured a wheel litter which he packed with medical supplies, then filled his arms and started forward under heavy artillery bombardment. He delivered the supplies as directed after having passed through the intense hostile counter barrage and aided in saving the lives of many wounded men. His personal courage and utter disregard of danger gave proof of his high soldierly qualities. At St. Baussant on September 12, 1918, he personally and gallantly led a charge on an enemy machine gun which held up the advance of his battalion. He shot and killed the gunner and killed and captured many of the enemy. His splendid valor and coolness were an inspiration to his men and materially assisted in the success of the operation. The Distinguished Service Cross is presented to Charles H. Blewett, Private, U.S. Army, for extraordinary heroism in action at Moulins, France, July 14 – 20, 1918. After being wounded in the arm by shrapnel, Private Bluett continued on duty with his platoon until he was relieved four days later. He then joined another platoon, going back to the line, and remained in action until the condition of his wound necessitated his evacuation. Company M, 142d Infantry Regiment, 36th Division, A.E.F. The Distinguished Service Cross is presented to Ernest H. Boggs, Corporal, U.S. Army, for extraordinary heroism in action near St. Etienne, France, October 8, 1918. After his company had made an attack and had taken up a new position, Corporal Boggs rendered great assistance in the reorganization of the new position. He was seriously wounded while in the performance of this work, but refused to go to the rear because it might weaken the position. Company F, 315th Supply Train, 90th Division, A.E.F. The Distinguished Service Cross is presented to Louis Bozarth, Corporal, U.S. Army, for extraordinary heroism in action near Madeleine Farm, France, November 8, 1918. While driving a supply train truck Corporal Bozarth was severely wounded in the left leg by fragment of an enemy high-explosive shell and the truck was badly damaged by shellfire. Assisted by his helper, he made temporary repairs and drove the truck to its destination. He later died as a result of the wounds received. Company E, 360th Infantry Regiment, 90th Division, A.E.F. The Distinguished Service Cross is presented to Leslie W. Brown, Captain, U.S. Army, for extraordinary heroism in action near Le Grande Carre Ferme, France, November 1, 1918. While advancing through a violent counterbarrage, a shell struck in the midst of the company headquarters group, practically annihilating it and wounding Captain Brown to such an extent that he lay for a time unconscious. When revived he effected a reorganization of his company and continued the advance. Shortly thereafter he was wounded a second time but refused to be evacuated, remaining with his command through two days and nights of severe fighting. The personal example of fearlessness displayed by Captain Brown inspired his men and those of neighboring units and contributed materially to the success of the operations. 4th Machine-Gun Battalion, 2d Division, A.E.F. The Distinguished Service Cross is presented to Andrew D. Bruce, Major, U.S. Army, for extraordinary heroism in action near Vierzy, France, July 17 – 18, 1918, and near Blanc Mont October 3 – 4, 1918. On the night of July 17-18, Major Bruce made a personal reconnaissance ahead of his troops through heavy flanking machine-gun fire. He pushed forward to the outpost lines through heavy artillery and machine-gun fire to keep in touch with all his company. On October 3-4 he made a personal reconnaissance on the left flank of his division through heavy shell fire and continual sniping and gained information which enabled him to well place his battalion and cover an exposed flank. The Distinguished Service Cross is presented to Alfred Buchanan, Sergeant, U.S. Army, for extraordinary heroism in action near Le Grand Carre Farm, France, November 1, 1918. After being severely wounded early in action Sergeant Buchanan had his wound dressed and started to rejoin his platoon, but passed through a gap in our lines and reached the German lines instead. He returned from there, located his platoon and led it with marked courage and coolness until he was severely wounded the second time. Commanding General, 2d Infantry Brigade, 1st Division, A.E.F. The Distinguished Service Cross is presented to Beaumont B. Buck, Brigadier General, U.S. Army, for extraordinary heroism in action before and during the attack of Berzy-le-Sec, France, July 21, 1918. Brigadier General Buck displayed conspicuous gallantry and heroic leadership of his command. When most of the officers of his brigade had fallen, General Buck, with contempt of personal danger, in spite of heavy artillery bombardment and machine-gun fire, traversed the front of his advancing forces, gave correct directions to his organization commanders and led the first wave of the culminating attack which stormed and captured the town. Headquarters, 1st Infantry Brigade, 1st Division, A.E.F. The Distinguished Service Cross is presented to Clifton Burnett, Sergeant, U.S. Army, for extraordinary heroism in action near Montrefagne, France, October 9, 1918. On October 9, Sergeant Burnett volunteered and established liaison between battalion commanders and brigade headquarters, under heavy artillery and machine-gun fire. On the same day he twice volunteered and carried messages and acting as guide across fields subjected to shell and machine-gun fire. He repeatedly repaired telephone wires when no lineman were available and continued this work through shell fire and gas bombardment, although four of the men working with him were wounded. Company C, 359th Infantry Regiment, 90th Division, A.E.F. The Distinguished Service Cross is presented to Thomas W. Butcher, Corporal, U.S. Army, for extraordinary heroism in action near Villers-devant-Dun, France, November 2, 1918. Having been wounded in the back by a machine-gun bullet, Corporal Butcher led his squad through heavy machine-gun fire, capturing three guns and capturing or killing all of the crews. 4th Regimental Section – Company C, 9th Field Battalion (Signal Corps), 5th Division, A.E.F. The Distinguished Service Cross is presented to Earnest A. Carlson, Corporal, U.S. Army, for extraordinary heroism in action in the Bois-de-Rappes, France, October 22, 1918. Although he was almost exhausted from gas and fatigue, Corporal Carlson remained on duty throughout the day and night, laying telephone lines from the regimental relay station to the front lines through heavy barrage fire from artillery and machine guns. The Distinguished Service Cross is presented to Alfred H. Carrigan, First Lieutenant, U.S. Army, for extraordinary heroism in action near St. Etienne, France, October 8, 1918. After he had led his men through the wire and obtained cover, Lieutenant Carrigan saw one of his men wounded and entangled in the wire. He left cover under heavy fire to bring this man to safety. As he was helping him out of the wire he was shot in the neck by a machine-gun bullet. Company A, 56th Infantry Regiment, 7th Division, A.E.F. The Distinguished Service Cross is presented to Lorenza C. Coats, Private, U.S. Army, for extraordinary heroism in action near Rembercourt, France, October 9 – November 11, 1918. As company and platoon runner, Private Coats worked tirelessly, being on duty almost constantly both day and night, and carrying numerous messages, under enemy machine-gun and artillery fire. Company F, 359th Infantry Regiment, 90th Division, A.E.F. The Distinguished Service Cross is presented to Charles Edward Cole, Private, U.S. Army, for extraordinary heroism in action near Bourrut, France, November 1, 1918. Under heavy machine-gun fire Private Cole organized two broken platoons and guided them into position. Through two days of strong operation he acted as runner, carrying messages to the front, and returning with valuable information, at all times exposed to severe shell and machine-gun fire. Company A, 308th Infantry Regiment, 77th Division, A.E.F. The Distinguished Service Cross is presented to Thomas M. Colley, First Lieutenant, U.S. Army, for extraordinary heroism in action near Stonne, France, November 6, 1918. Though wounded, Lieutenant Colley voluntarily went through shell fire and gave first aid to the wounded members of his platoon, thereby receiving additional wounds. The Distinguished Service Cross is presented to Clive C. Collier, Corporal, U.S. Army, for extraordinary heroism in action near Villers-devant-Dun, France, November 1 & 2, 1918. Corporal Collier courageously led his squad through heavy machine-gun and artillery fire and drove off several machine-gun crews. The next day after being wounded by fire from a heavy Maxim gun, he continued the advance, captured the gun, killed one of the crew, and took two prisoners. 167th Infantry Regiment, 42d Division, A.E.F. The Distinguished Service Cross is presented to Patrick Collins, Second Lieutenant, U.S. Army, for extraordinary heroism in action near Sergy, France, July 31, 1918. Being informed that a wounded man was lying in “No Man’s Land”. Lieutenant Collins (then sergeant) immediately volunteered and, with Private Pitts, went to his aid. The intense fire of the enemy necessitated crawling the entire distance. While on the return trip the wounded man was hit by a machine-gun bullet and instantly killed, but these two men brought in the dead body, crawling with great difficulty over the shell-torn ground. 315th Train Headquarters & Military Police, 90th Division, A.E.F. The Distinguished Service Cross is presented to Thomas Larkin Cooksey, Sergeant, U.S. Army, for extraordinary heroism in action near Cantigny-Devant-Sassey, France, November 5, 1918. During a very heavy attack in the vicinity of his post, where artillery fire and aircraft machine-gun fire had created a most confusing situation, Sergeant Cooksey calmly directed traffic, aided wounded, and removed obstructions, thereby preventing wild disorder. He assisted the drivers of ammunition trucks getting their machines to places of safety. 3d Machine-Gun Battalion, 1st Division, A.E.F. The Distinguished Service Cross is presented to James A. Cooper, Second Lieutenant, U.S. Army, for extraordinary heroism in action between Berzy-le-Sec and Soissons, France, July 18 – 19, 1918. Second Lieutenant Cooper’s leadership under fire was distinguished by heroic conduct and the prompt utilization of every advantage. Through his fearlessness, devotion to duty, and while leading the men forward on the second day he was killed. Company D, 9th Infantry Regiment, 2d Division, A.E.F. The Distinguished Service Cross is presented to Arthur M. Courtney, Private, U.S. Army, for extraordinary heroism in action near La Fontaine au Croncq Farm, France, November 4, 1918. Private Courtney, a stretcher bearer, displayed exceptional gallantry in continuing to remove wounded from a field swept by machine-gun fire of such intensity that five of his associates were killed and two others wounded. 370th Infantry Regiment, 93d Division, A.E.F. The Distinguished Service Cross is presented to William B. Crawford, Captain, U.S. Army, for extraordinary heroism in action at Ferme- de-la-Riviere, France, September 30, 1918. Having been placed in command of Company L, whose task it was to lead the advance in an attack, the same undertaking having failed the day previous, Captain Crawford, in order to assure the success of the attack, personally led the advanced element of his company in the face of heavy fire. The objective was successfully carried, due to Captain Crawford’s gallant conduct. The Distinguished Service Cross is presented to Will C. Curtis, Private, U.S. Army, for extraordinary heroism in action near St. Etienne, France, October 8, 1918. While passing through a heavy enemy barrage Private Curtis was mortally wounded, but continued to advance, encouraging his comrades to follow him. His example of courage and fearlessness gave confidence to his comrades and the advance was successful. He later died of his wounds. Headquarters Company, 360th Infantry Regiment, 90th Division, A.E.F. The Distinguished Service Cross is presented to Fred W. Dallas, Corporal, U.S. Army, for extraordinary heroism in action near the Bois-de-Argonne, France, November 2, 1918. Although his arm was shattered by a machine-gun bullet, Corporal Dallas refused to go to the rear, but continued to advance under extremely heavy machine-gun fire until he received two more wounds, one piercing his leg and making it impossible for him to advance further. While crawling to the rear he encountered another wounded man, and assisted him to the dressing station. The Distinguished Service Cross is presented to Steve G. Danysch, Sergeant, U.S. Army, for extraordinary heroism in action south of Soissons, France, July 19, 1918. Having received a severe wound in the head, Sergeant Danysch refused to be evacuated and continued to lead his platoon with great bravery until he fell unconscious. He died from his wounds several days later. Company E, 56th Infantry Regiment, 7th Division, A.E.F. The Distinguished Service Cross is presented to George Deggs, Private, U.S. Army, for extraordinary heroism in action near Preny, France, November 2, 1918. During an enemy counterattack the dugout in which Private Deggs and his companions were taking shelter was surrounded by a group of the enemy, who were demanding surrender. Jumping to the fire step, and with the aid of a rifle, Private Deggs killed four of the enemy and caused the rest to flee in confusion. Company C, 2d Engineers, 2d Division, A.E.F. The Distinguished Service Cross is presented to John A. Doogs, Private, U.S. Army, for extraordinary heroism in action near Medeah Ferme, France, October 9, 1918. Crawling forward under heavy machine-gun fire, Private Doogs assisted in bringing a wounded comrade to safety. Company A, 141st Infantry Regiment, 36th Division, A.E.F. The Distinguished Service Cross is presented to Sam Dreben, First Sergeant, U.S. Army, for extraordinary heroism in action near St. Etienne, France, October 8, 1918. Sergeant Dreben discovered a party of German troops going to the support of a machine-gun nest situated in a pocket near where the French and American lines joined. Sergeant Dreben called for volunteers and, with the aid of about 30 men, rushed the German positions, captured four machine-guns, killed more than 40 of the enemy, captured two, and returned to our lines without the loss of a man. Company C, 3d Machine-Gun Battalion, 1st Division, A.E.F. The Distinguished Service Cross is presented to Daniel R. Edwards, Private, U.S. Army, for extraordinary heroism in action at Cantigny, France, may 28 – 30, 1918. Serving as gunner of his machine-gun squad Private Edwards advanced with the first assault line of the Infantry and while passing through the village of Cantigny at 5:30 a.m., May 28 carrying his machine gun upon his shoulder, he was attacked by an enemy soldier and bayoneted, receiving a severe wrist wound; the enemy soldier was killed by an infantryman. Continuing in the advance beyond Cantigny and meeting intense enemy fire, the attacking wave was halted. Private Edwards with his squad remained in an advanced position, protecting with his fire the Infantry which had fallen back to a more advantageous position and were entrenching. While thus engaged the machine gunners repulsed two determined enemy counterattacks, during which the three members of the squad accompanying Private Edwards were killed and he himself severely wounded. Despite these wounds, which he himself dressed, he remained alone in his position throughout the day, firing whenever a target offered, withstanding attacks by liquid fire and machine-gun fire, he refused to be evacuated and continued to operate his gun until nightfall, when his company was relieved. His extraordinary bravery and devotion to duty, his fortitude and undaunted determination despite his numerous and painful wounds, incited the men of his battalion to splendid endeavors and raised their morale to an extremely high pitch. Company E, 39th Infantry Regiment, 4th Division, A.E.F. The Distinguished Service Cross is presented to Edwin A. Elliott, Sergeant, U.S. Army, for extraordinary heroism in action north of Nantillois, France, October 12, 1918. An ammunition detail having failed several times to carry ammunition over a barraged zone, Sergeant Elliott voluntarily gathered and conducted an ammunition detail over 3 kilometers under extremely heavy artillery and machine-gun fire to the front line. In advance of his men he dragged a full box of Springfield ammunition for over a kilometer and distributed it to the front line. Later, he volunteered to carry, and carried, a message back to regimental headquarters. Company B, 315th Engineers, 90th Division, A.E.F. The Distinguished Service Cross is presented to John A. Focht, First Lieutenant, U.S. Army, for extraordinary heroism in action near Madeline Farm, October 27, 1918. Knocked down and severely wounded when enemy shells hit the building where his company was at mess, Lieutenant Focht remained in the shelled area and, with the assistance of one of his men, carried out the wounded to a place of safety, where their wounds could be dressed. Quartermaster Corps, 5th Division, A.E.F. The Distinguished Service Cross is presented to Harry L. Fraser, Captain, U.S. Army, for extraordinary heroism in action near Brandeville, France, November 10, 1918. Captain Frazer was directing a working party, which was being heavily bombarded. Having been ordered to safety, Captain Fraser, thinking only of the welfare of his men, went forth to see that all had found shelter, and was instantly killed. The Distinguished Service Cross is presented to John P. Gaines, Second Lieutenant, U.S. Army, for extraordinary heroism in action near Soissons, France, July 20, 1918. Second Lieutenant Gaines stayed with his command and led it to its final objective . After being wounded, he directed the consolidation of his position, and yielded his post only at the command of a superior officer. Company C, 325th Infantry Regiment, 82d Division, A.E.F. The Distinguished Service Cross is presented to Graviel Garcia, Private, U.S. Army, for extraordinary heroism in action near St. Juvin, France, October 16. 1918. Private Garcia voluntarily went out into No Man’s Land under heavy enemy fire and administered first aid to a wounded comrade. While making his way back to our lines with the wounded man he was himself severely wounded. The Distinguished Service Cross is presented to Victor E. Garrett, Second Lieutenant, U.S. Army, for extraordinary heroism in action near Berzy-le-Sec, France, July 19, 1918, and near Exermont, France, October 4, 1918. Lieutenant Garrett displayed great courage and self-sacrifice during the four days’ battle south of Soissons, conducting his platoon with calmness and good judgment, especially on July 19, 1918, when he aided in keeping his company together when large shells struck among the men, personally supervising the care of the wounded and getting them to aid stations, with utter disregard of his own safety, while subjected to heavy enemy artillery and machine-gun fire. Lieutenant Garrett displayed extraordinary heroism during the three days previous to the attack on Exermont, France, by refusing to be evacuated although suffering from an injury to his foot, remaining at his post until October 4, 1918, when acting as liaison officer, he with five men was suddenly confronted by 20 Germans, and while leading the attack he made the supreme sacrifice. His dauntless courage and excellent example enabled his men to take the Germans as prisoners. Company F, 141st Infantry Regiment, 36th Division, A.E.F. The Distinguished Service Cross is presented to Robert A. Gaston, Corporal, U.S. Army, for extraordinary heroism in action near St. Etienne, France, October 8, 1918. Corporal Gaston led three attempts to take an enemy machine-gun nest under enfilade fire. In the final attempt he was wounded, but continued to advance until he was killed by machine-gun fire. 20th Field Artillery (Attached), 5th Division, A.E.F. The Distinguished Service Cross is presented to Othel J. Gee, First Lieutenant (Medical Corps), U.S. Army, for extraordinary heroism in action near Vieville-en-Haye, France, September 27, 1918. Lieutenant Gee voluntarily ran to the assistance of a wounded soldier, dressed his wounds, and carried him to shelter through severe shell fire. 16th Infantry Regiment, 1st Division, A.E.F. The Distinguished Service Cross is presented to Sidney C. Graves, Major, U.S. Army, for extraordinary heroism in action in the Bois-de-Fontaine, France, April 29, 1918. Having located an enemy machine gun in front of his position, Major (then captain) Graves, with three men, voluntarily crawled out to the position of the machine gun, in full view and within 100 yards of the enemy lines, shot the gunner, killed the rest of the crew with grenades, and returned with his party without a casualty. 117th Train Headquarters and Military Police, 42d Division, A.E.F. The Distinguished Service Cross is presented to Jay D. Gumm, Sergeant, U.S. Army, for extraordinary heroism in action at Vadenay, north of Chalons-sur-Marne, France, July 15, 1918. During the shelling of Vadenay Sergeant Gumm voluntarily left a place of safety and went through heavy fire of major caliber shells and rescued a French soldier who was lying, severely wounded, in the street. 360th Infantry Regiment, 90th Division, A.E.F. The Distinguished Service Cross is presented to Gerald H. Gunst, First Lieutenant, U.S. Army, for extraordinary heroism in action near Andevanne, France, November 2, 1918. When several officers of a company became casualties, Lieutenant Gunst took command of an assault platoon. Although wounded in the leg while leading his platoon in the attack, he continued on until the objective was reached. Hen then voluntarily carried an important message to regimental headquarters, crossing an area covered by enemy machine-gun fire. The Distinguished Service Cross is presented to Rosco Robert Haley, First Lieutenant, U.S. Army, for extraordinary heroism in action near St. Etienne, France, October 8, 1918. Lieutenant Haley was severely wounded in the head while leading his platoon forward, but he continued in the advance, directing the cutting of wire entanglements under heavy fire. Shortly afterward he received another wound in the face, but he again refused to go to the rear, remaining with his platoon encouraging his men and maintaining organization until he became unconscious. Company G, 5th Ammunition Train, 5th Division, A.E.F. The Distinguished Service Cross is presented to Charles C. Hammons, Corporal, U.S. Army, for extraordinary heroism in action near Septsarges, France, October 24, 1918. When an enemy shell struck some pyrotechnics stored in the ammunition dump of his organization, Corporal Hammons directed and assisted in the removal of inflammable material and placing the fire under control. Through his, coolness and courage the destruction of a large quantity of nearby ammunition was avoided. 112th Infantry Regiment, 36th Division, A.E.F. The Distinguished Service Cross is presented to Stayton M. Hankins, First Lieutenant, U.S. Army, for extraordinary heroism in action near St. Etienne, France, October 8, 1918. Although severely wounded in the leg. Lieutenant Hankins continued in command of his company, remaining in action until he fell from complete exhaustion and was evacuated. Company L, 142d Infantry Regiment, 36th Division, A.E.F. The Distinguished Service Cross is presented to William T. Hardin, Sergeant, U.S. Army, for extraordinary heroism in action near St. Etienne, France, October 8, 1918. Sergeant Hardin was severely wounded in the right shoulder early in the action, but although bleeding profusely he refused to go to the rear until the enemy’s position had been captured and the line consolidated. Battery F, 7th Field Artillery, 1st Division, A.E.F. The Distinguished Service Cross is presented to Leon E. Harlow, Corporal, U.S. Army, for extraordinary heroism in action near Cantigny, France, May 28 – 30, 1918. Corporal Harlow voluntarily left his shelter and went out into a smothering bombardment to perform exhausting labor in repairing telephone lines. He repaired five breaks in a 50-yard stretch of wire, and when the same small section was again broken in four places he carried a message through heavy shelling to the regimental post of command. Company D, 56th Infantry Regiment, 7th Division, A.E.F. The Distinguished Service Cross is presented to David C. Harris, Jr., Private, U.S. Army, for extraordinary heroism in action in the Puvenelle sector, France, October 13, 1918. Private Harris was dispatched with an important message to battalion headquarters after three runners had failed to penetrate the severe enemy barrage. With an utter disregard for his own personal safety Private Harris succeeded in passing through the heavy enemy artillery fire and delivered the message. After returning to his company Private Harris found that one of the officers of his company had been wounded and made another trip to battalion headquarters to secure first aid. While making this trip he assisted another wounded officer in the first-aid station, making in all three trips over this extremely dangerous area. During the performance of this act of gallantry Private Harris was severely gassed. Private Harris’ extraordinary courage and devotion to duty and his successful deliver of the message were of great importance to his company, and resulted in the saving of many lives. Company C, 111th Field Signal Battalion, 36th Division, A.E.F. The Distinguished Service Cross is presented to Carroll E. Head, Corporal, U.S. Army, for extraordinary heroism in action near Attigny, France, October 14, 1918. The enemy having located the advance divisional information center, the personnel was removed to a new position. Corporal Head volunteered and removed the switchboard, changing the wire connections so that communication would not be interrupted. For five or sis minutes he worked under intense shell fire, several shells passing through the building as he worked. He succeeded, however, in reestablishing the line connections outside the building. Immediately after he left the building it was completely demolished by a shell. Company H, 4th Infantry Regiment, 3d Division, A.E.F. The Distinguished Service Cross is presented to Thomas L. Hensley, Private First Class, U.S. Army, for extraordinary heroism in action near Roncheres, France, July 29, 1918. Going from one wounded comrade to another, exposed to heavy machine-gun and deadly sniper fire, Private Hensley administered aid to all that he could reach before being killed in the performance of this heroic mission. 359th Infantry Regiment, 90th Division, A.E.F. The Distinguished Service Cross is presented to Herbert S. Hilburn, Captain, U.S. Army, for extraordinary heroism in action near Villers-devant- Dun, France, November 2, 1918. Under heavy machine-gun fire, Captain Hilburn repeatedly went to the rear of his company to rally and reorganize it, and then rushed forward to lead his men on. Having taken the town of Villers-devant-Dun and the crest beyond, he held it with only 16 men until the next morning against superior numbers of the enemy. 5th Machine-Gun Battalion, 2d Division, A.E.F. The Distinguished Service Cross is presented to Chester J. Hirschfelder, Captain, U.S. Army, for extraordinary heroism in action near St. Etienne, France, October 4, 1918. When an enemy machine gun was inflicting heavy casualties upon his company, Captain Hirschfelder crawled forward alone across a field exposed to heavy machine-gun fire and threw hand grenades into the enemy position. His action silenced the machine gun and prevented further casualties to his company. Medical Corps, 2d Engineers, 2d Division, A.E.F. The Distinguished Service Cross is presented to Jefferson L. Holt, Private, U.S. Army, for extraordinary heroism in action during the day and night of June 2 – 3, 1918. Private Holt exposed himself to severe and continuous fire beyond call of duty in order to bring aid to wounded engineers and marines. Company M, 9th Infantry Regiment, 2d Division, A.E.F. The Distinguished Service Cross is presented to Clyde Houston, Private, U.S. Army, for extraordinary heroism in action near Tuilerie Farm, France, November 4 and 7 – 11, 1918. On November 4, Private Houston showed unusual courage and daring in carrying messages under heavy machine-gun and artillery fire. On November 7-11, he carried messages between his company and battalion headquarters while the enemy were endeavoring to cut off communication by machine- gun and shell fire. Company M, 16th Infantry Regiment, 1st Division, A.E.F. The Distinguished Service Cross is presented to George C. Jackson, Sergeant, U.S. Army, for extraordinary heroism in action near Fleville, France, October 2, 1918. His platoon becoming disorganized by enemy artillery fire, Sergeant Jackson halted his men, reorganized them under the heavy fire and resumed the advance. Later he borrowed an automatic rifle from one of the men in his platoon, and, firing it from his hip, advanced on an enemy machine-gun, killing two members of the crew and capturing another. The Distinguished Service Cross is presented to Alva Lee Johnson, Corporal, U.S. Army, for extraordinary heroism in action near Septsarges, France, October 24, 1918. When an enemy shell struck some pyrotechnics stored in the ammunition dump of his organization, Corporal Johnson directed and assisted in the removal of inflammable material and placing the fire under control. Through his coolness and courage the destruction of a large quantity of nearby ammunition was avoided. The Distinguished Service Cross is presented to Frank Johnston, Corporal, U.S. Army, for extraordinary heroism in action near St. Etienne, France, October 8, 1918. After his company had been thrown into confusion by running into its own artillery barrage, Corporal Johnston reorganized a large part of the company and continued the advance. His command was again separated by a barrage of enemy artillery fire, but he continued with that portion of the company left under his control until he was twice wounded and carried to the rear. Company A, 360th Infantry Regiment, 90th Division, A.E.F. The Distinguished Service Cross is presented to Arthur Elmer Joiner, Private, U.S. Army, for extraordinary heroism in action near Le Grand Carre Farm, France, November 1, 1918. Private Joiner, a battalion runner, made four trips to his company through intense machine-gun fire. On the fourth trip he was severely wounded, but he continued to crawl along until he intercepted another runner and gave him the message. Company K, 28th Infantry Regiment, 1st Division, A.E.F. The Distinguished Service Cross is presented to George L. Keene, Corporal, U.S. Army, for extraordinary heroism in action near Soissons, France, July 18 – 19, 1918. Corporal Keene, then acting sergeant, rendered splendid assistance to his commanding officer in helping him to organize and lead a group of American and French Colonial soldiers against an enemy strong point located in a rock quarry on high ground. During the attack, Corporal Keene was in command of the troops on the right flank, and in storming the position, he rushed forward at the head of his men, hurled a hand grenade in the trenches, subdued one of the most difficult posts of the enemy position and personally captured an officer on whom was found important maps of the enemy positions. On the second day, Corporal Keene served in the capacity of an officer by commanding a company in the first wave of the attack formation and when his battalion commander became wounded he rendered valuable aid in assisting in maintaining control of formations until the objective was reached. Company E, 315th Engineers, 90th Division, A.E.F. The Distinguished Service Cross is presented to Martin H. Kinney, Sergeant, U.S. Army, for extraordinary heroism in action near Pont-a- Mousson, France, September 26, 1918. After receiving orders to withdraw from position, Sergeant Kinney saw an officer lying wounded and helpless about 15 yards in advance of the line. With utter disregard for his own safety he crawled through heavy enemy fire from the front and flanks to the aid of the officer and dragged him back about 50 yards to the shelter of a small mound, where he dressed the officer’s wound, and then carried him through the barrage to a first-aid station. The Distinguished Service Cross is presented to Dan C. Leeper, Captain, U.S. Army, for extraordinary heroism in action near Villers-devant-Dun, France, November 2, 1918. In the face of intense machine-gun fire Captain Leeper led his company forward to its objective, capturing a machine-gun nest and making possible the capture of a strong enemy position on a hill. This officer was severely wounded during these operations, but his courage was an inspiration to his men in consolidating their position. Company I, 141st Infantry Regiment, 36th Division, A.E.F. The Distinguished Service Cross is presented to Abner E. Lipscomb, Sergeant, U.S. Army, for extraordinary heroism in action near St. Etienne, France, October 8, 1918. After all the officers of his company were either killed or wounded, Sergeant Lipscomb took command of his company, and although twice wounded, continued to advance. He led the company with courage and skill; held difficult positions in the exposed salient occupied by the first battalion, and established a flank guard. Company K, 360th Infantry Regiment, 90th Division, A.E.F. The Distinguished Service Cross is presented to Frank B. Loescher, Sergeant, U.S. Army, for extraordinary heroism in action at Le Grand Carre Farm, France, November 1, 1918. Although wounded in the arm early in the attack, Sergeant Loescher continued to lead his platoon in the attack on a strong enemy position, and by the use of rifles, rifle grenades, and hand grenades, and after capturing several machine-gun nests, including one dugout containing 70 Germans, forced the entire strong point to yield, including two German companies armed with machine guns, which had been holding up the advance of the whole company. 132d Machine-Gun Battalion, 36th Division, A.E.F. The Distinguished Service Cross is presented to John S. Loomis, First Lieutenant, U.S. Army, for extraordinary heroism in action near St. Etienne, France, October 10, 1918. During an attack to straighten the front of the 71st Brigade, Lieutenant Loomis, in command of a machine-gun platoon, upon arriving at the objective, discovered that all of the infantry officers in the vicinity had fallen, thus leaving their troops in confusion. Although under a heavy barrage of high explosive and gas shells, machine-gun and rifle fire, Lieutenant Loomis removed his gas mask in order that his voice might carry, and, with great coolness, reorganized the infantry forces, thus enabling them to hold the ground they had gained. Lieutenant Loomis remained in command until he was so severely gassed that he had to be carried from the field. Company K, 26th Infantry Regiment, 1st Division, A.E.F. The Distinguished Service Cross is presented to John C. Manning, Corporal, U.S. Army, for extraordinary heroism in action near Paris- Soissons Road, France, July 18 – 19, 1918. Corporal Manning voluntarily left his shelter and went to the rescue of two wounded French soldiers who were in a burning tank. The rescue was made under an intense fire from the enemy, in plain view and while they were using all efforts to complete the destruction of the tank and prevent the rescue of its inmates. Corporal Manning succeeded in forcing open a door of the burning tank, dragging out the wounded men, and bringing them to a place of shelter, from which they were later evacuated. Company G, 26th Infantry Regiment, 1st Division, A.E.F. The Distinguished Service Cross is presented to Frank Marlin, Private, U.S. Army, for extraordinary heroism in action near Soissons, France, July 19, 1918. With two other soldiers Private Marlin rushed a machine-gun position, killed the crew, and captured the gun in order to make the advance of his platoon possible. 141st Infantry Regiment, 36th Division, A.E.F. The Distinguished Service Cross is presented to Claude H. Mason, First Lieutenant, U.S. Army, for extraordinary heroism in action near St. Etienne, France, October 8 – 10, 1918. On October 8, Lieutenant Mason followed the wave of attack under heavy shell and sniper fire, and maintained an aid station with no protection, near the front lines, giving first aid to the wounded and evacuating the injured from a heavily shelled area, for a period of three days. Company B, 315th Train Headquarters & Military Police, 90th Division, A.E.F. The Distinguished Service Cross is presented to Joe C. May, Corporal, U.S. Army, for extraordinary heroism in action near Montigny-devant-Sassey, France, November 5, 1918. During a very heavy attack in the vicinity of his post, where artillery fire and aircraft machine-gun fire had created a most confusing situation, Corporal May calmly directed traffic, aided wounded, and removed obstructions, thereby preventing wild disorder. He assisted the drivers of ammunition trucks in getting their machines to a place of safety. Machine-Gun Company, 370th Infantry Regiment, 93d Division, A.E.F. The Distinguished Service Cross is presented to Andy McCall, Private, U.S. Army, for extraordinary heroism in action near Ferme de la Riviere, France, September 30, 1918. Although relieved on the previous night, Private McCall willingly agreed to substitute for a sick comrade, returning the following day to his dangerous post as advance machine-gunner. During a heavy shelling of his position Private McCall was killed. The Distinguished Service Cross is presented to John C. McKimmey, Second Lieutenant, U.S. Army, for extraordinary heroism in action near St. Etienne, France, October 8, 1918. His organization harassed, and suffering severe losses from enemy machine-gun fire, Lieutenant McKimmey, accompanied by two sergeants, left shelter and advanced across an open area, exposed to enemy fire, in order to attack their position. He lost his life while making the attempt. Company I, 142d Infantry Regiment, 36th Division, A.E.F. The Distinguished Service Cross is presented to Charles G. Montgomery, Private, U.S. Army, for extraordinary heroism in action near Attigny, France, October 27, 1918. Private Montgomery volunteered and carried a message from battalion headquarters, through the enemy’s fire, to our support line, and guided a combat group into position, in absolute disregard of his personal safety. He was caught in a heavy barrage and was killed. 7th Engineers, 5th Division, A.E.F. The Distinguished Service Cross is presented to Charles J. Moore, Captain, U.S. Army, for extraordinary heroism in action on the Andon River, France. Captain Moore went forward under heavy artillery fire, reorganized his men who were in scattered units, after they had laid bridges across the Andon River. After being severely wounded, Captain Moore gave instructions to his subordinates for carrying on the work. Company D, 3d Machine-Gun Battalion, 1st Division, A.E.F. The Distinguished Service Cross is presented to John H. Moore, Second Lieutenant, U.S. Army, for extraordinary heroism in action near Cutry, France, on July 18, 1918. While courageously leading his section in the face of intense fire, Second Lieutenant Moore was knocked down by a shell explosion, but continued his leadership as soon as he regained consciousness and personally reconnoitered the area in advance to find a less dangerous route. He succeeded and thereby made it possible for his men to go forward, but he himself was killed in the undertaking. The Distinguished Service Cross is presented to Wallis J. Moore, Captain, U.S. Army, for extraordinary heroism in action near St. Etienne, France, October 8, 1918. Captain Moore, although wounded by shrapnel, refused to go the rear, and proceeded to reorganize portions of three infantry platoons, whose officers had become casualties, thus protecting the right flank of the 141st Infantry. He went to the rear only after he had been severely gassed. Headquarters Company, 142d Infantry Regiment, 36th Division, A.E.F. The Distinguished Service Cross is presented to Jesse S. Morrison, Sergeant, U.S. Army, for extraordinary heroism in action near Attigny, France, October 14, 1918. Sergeant Morrison drove a motorcycle through intense artillery fire and assisted in the rescue of a wounded soldier under machine-gun fire, driving back with him under intense bombardment to the dressing station. 60th Infantry Regiment, 5th Division, A.E.F. The Distinguished Service Cross is presented to Otho K. Morrison, First Lieutenant, U.S. Army, for extraordinary heroism in action near Cunel, France, October 15, 1918; and at Juvigny, France, November 10, 1918. Lieutenant Morrison displayed exceptional courage and leadership when, being cut off by the enemy with his battalion command and a small detachment from battalion headquarters, he led patrols and drove off enemy machine-gunners who had infiltrated to within striking distance of the group. On November 10, he led his company against the fortified heights of Juvigny, driving back the enemy for more than a kilometer. Company D, 8th Machine-Gun Battalion, 3d Division, A.E.F. The Distinguished Service Cross is presented to Louis W. Myers, Corporal, U.S. Army, for extraordinary heroism in action near Le Rocq, France, July 14 – 15, 1918. Corporal Myers repeatedly exposed himself to the terrific enemy shell fire in carrying messages and rendering first aid to the wounded. The Distinguished Service Cross is presented to E. Kelley Nail, Sergeant, U.S. Army, for extraordinary heroism in action near St. Etienne, France, October 8, 1918. Sergeant Nail, in charge of a patrol, successfully flanked a machine-gun nest of several guns which was holding up the advance of his company and captured four German officers. Company D, 2d Engineers, 2d Division, A.E.F. The Distinguished Service Cross is presented to Charles E. Nickels, Sergeant, U.S. Army, for extraordinary heroism in action near St. Etienne-a- Arnes, France, October 5 – 7, 1918. Advancing ahead of the infantry, Sergeant Nickels made several reconnaissances of the town of St. Etienne-a-Arnes, France, and, in spite of the danger, exposed to machine-gun and artillery fire of our own and enemy guns, he procured and returned with valuable information. The Distinguished Service Cross is presented to John J. O’Brien, Sergeant, U.S. Army, for extraordinary heroism in action near St. Etienne-a- Arnes, France, October 5 – 7, 1918. Advancing ahead of the infantry, Sergeant O’Brien made several reconnaissances of the town of St. Etienne-a-Arnes; and, in spite of the danger exposed to machine-gun and artillery fire of our own and enemy guns, he procured and returned with valuable information. The Distinguished Service Cross is presented to Ira C. Ogden, Captain, U.S. Army, for extraordinary heroism in action near St. Etienne, France, October 9 – 10, 1918. Due to casualties among field officers, Captain Ogden was placed in command of the support line. On the afternoon of October 10, an advance was ordered, and Captain Ogden requested permission to accompany the front line. He was placed in command of the front line of the regiment and advanced with it at 4:30 p.m. Regardless of personal danger, he crossed areas swept by machine-gun fire, and was killed in action shortly after he had reported as having reached the objective. Company I, 125th Infantry Regiment, 32d Division, A.E.F. The Distinguished Service Cross is presented to Concepcion Ortiz, Private, U.S. Army, for extraordinary heroism in action near Romagne, France, October 11, 1918. On the morning of October 11 Private Ortiz made numerous trips across a valley which was swept by continuous and terrific machine-gun fire, carrying messages of great importance from his company in the front line to his battalion post of command. After having successfully and fearlessly carried many messages he lost his life while performing the hazardous duty. Medical Detachment, 7th Field Artillery, 1st Division, A.E.F. The Distinguished Service Cross is presented to William L. Packard, Private, U.S. Army, for extraordinary heroism in action near Exermont, France, October 5, 1918. In going to the aid of a wounded comrade, Private Packard was himself mortally wounded, but continued on his self-sacrificing mission till he was too weak from loss of blood to continue his work, dying shortly afterward. Company G, 9th Infantry Regiment, 2d Division, A.E.F. The Distinguished Service Cross is presented to John A. Parker, Private, U.S. Army, for extraordinary heroism in action near Medeah Ferme, France, October 8, 1918. In addition to his duties as runner, Private Parker volunteered and assisted in cleaning out many dugouts. At one dugout he was attacked by a number of Germans. He counterattacked with grenades, capturing ten prisoners and two light machine-guns. Company K, 141st Infantry Regiment, 36th Division, A.E.F. The Distinguished Service Cross is presented to Jack Peacock, Sergeant, U.S. Army, for extraordinary heroism in action near St. Etienne, France, October 8, 1918. All the officers of his company being killed, Sergeant Peacock took command and led the company into action, capturing 62 German prisoners who were occupying and directing a fire against our troops from six machine-gun nests. The Distinguished Service Cross is presented to Herbert N. Peters, Captain, U.S. Army, for extraordinary heroism in action near Les Huit Chemins, France, September 12 – 14, 1918. As commander of the support company of his battalion, Captain Peters displayed courage and leadership by rushing two platoons into position to protect the right flank of the battalion, which had suddenly become exposed. Under his personal leadership, in the face of intense machine-gun and shell, fire a number of enemy machine-gun nests were stormed and enemy combat troops dispersed. Serious danger to the advancing line was thereby averted. Captain Peters was killed shortly afterward in a raid on the enemy. 2d Machine-Gun Battalion, 1st Division, A.E.F. The Distinguished Service Cross is presented to John P. Pryor, Captain, U.S. Army, for extraordinary heroism in action during the Meuse- Argonne offensive, near Exermont, France, October 4 – 6, 1918. Attacked by Spanish influenza, Captain Pryor refused to leave his command for medical treatment because of the heavy casualties among the officers of the battalion to which his company was attached. Captain Pryor remained with his command, participating in the heavy fighting around Exermont and Hill 240, inspiring his men through his conspicuous bravery and indomitable will until he collapsed upon the field of battle, and was carried from the field, dying while en route to the hospital. Company B, 39th Infantry Regiment, 4th Division, A.E.F. The Distinguished Service Cross is presented to Carl Rassmussen, Private, U.S. Army, for extraordinary heroism in action near Bois-de-Brieulles, France, September 27, 1918. Private Rassmussen, a company runner, volunteered and made two trips from the post of command of his own regiment to that of the regiment adjoining his own, passing each time more than a thousand yards under intense enemy machine-gun fire. Company K, 106th Infantry Regiment, 27th Division, A.E.F. The Distinguished Service Cross is presented to John W. Rawlinson, Private, U.S. Army, for extraordinary heroism in action at Quinne-nont, France, near Ronssoy, France, September 28, 1918. After assisting in repulsing a strong enemy counterattack, Private Rawlinson, with two other soldiers, became separated from his company, due to the heavy fog. Seeing a superior force of the enemy in a trench, they unhesitatingly attacked, and after killing and wounding several of the enemy, they captured numerous prisoners and brought them back to our lines. The Distinguished Service Cross is presented to John D. Reese, Private, U.S. Army, for extraordinary heroism in action at Roche, France, October 27, 1918. Though he was suffering from illness and had been told to go to the rear, Private Reese for three days remained on duty as a runner, and, when almost exhausted, went forward with his company in attack, voluntarily accompanying a liaison patrol on a dangerous mission. The Distinguished Service Cross is presented to William Reese, Private First Class, U.S. Army, for extraordinary heroism in action near Romagne, France, October 11, 1918. Private Reese displayed exceptional courage in repeatedly crossing an area swept by machine-gun and shell fire to carry messages to battalion headquarters after other soldiers had been killed or wounded in attempting the same mission. Chief of Staff, 2d Division, A.E.F. The Distinguished Service Cross is presented to James C. Rhea, Colonel (Cavalry), U.S. Army, for extraordinary heroism in action near St. Etienne, France, October 9, 1918. Colonel Rhea, with Lieutenant Le Pelletier de Woillemont, French Army, voluntarily undertook an important reconnaissance under hazardous circumstances during the Masif Blanc Mont operations at a time when accurate information concerning our advanced positions was greatly needed and could not be obtained from other sources. In an automobile, whose conspicuous appearance drew the concentrated fire of enemy artillery and machine-guns, they proceeded one mile across open ground to the town of St. Etienne, where our troops were in contact with the enemy. Under fire these two officers reconnoitered the front lines, locating the position of the enemy as well as that of the French units on the flank, and returned across the open with complete, reliable, and timely information of the highest military value in subsequent operations. Company M, 47th Infantry Regiment, 4th Division, A.E.F. The Distinguished Service Cross is presented to Edward D. Ritchie, Private, U.S. Army, for extraordinary heroism in action near St. Thibaut, France, August 10, 1918. While on an outpost near the Vesle River, Private Ritchie volunteered to accompany Corporal John S. Weimer in rescuing a wounded soldier who had been left by members of a patrol in a shell hole some distance to the front. Under fire from machine guns and snipers, Private Ritchie and Corporal Weimer proceeded to the shell hole and found the wounded man, who was unable to walk. Suggesting that the three of them in a group would make a more conspicuous target for the enemy, Private Ritchie offered to run ahead to draw the enemy fire, while his comrade assisted the wounded man. He made his way back to shelter under continuous machine-gun and sniper fire, while Corporal Weimer carried the wounded soldier to safety. The Distinguished Service Cross is presented to Chester A. Roberts, Sergeant, U.S. Army, for extraordinary heroism in action near St. Etienne, France, October 8, 1918. Sergeant Roberts led an automatic rifle team of seven men in an attack on an enemy machine-gun nest, advancing 150 yards, under heavy machine-gun fire, to within 50 yards of the enemy position, from which point he directed the fire of his team with such skill that the enemy surrendered; resulting in the capture of four officers, 112 men, and 17 machine-guns. 357th Infantry Regiment, 90th Division, A.E.F. The Distinguished Service Cross is presented to Tobin C. Rote, First Lieutenant, U.S. Army, for extraordinary heroism in action near Fey-en-Haye, France, September 12, 1918. Lieutenant Rote displayed daring in rushing machine-gun emplacements in the path of his platoon. Single-handed he captured crews and emplacements of enemy machine guns. 357th Ambulance Company, 315th Sanitary Train, 90th Division, A.E.F. The Distinguished Service Cross is presented to Henry F. Ruland, Private, U.S. Army, for extraordinary heroism in action near Vilcey-sur-Trey, France, September 12,1918. With another soldier, Private Ruland left the shelter of a wood and went forward to rescue a soldier who had fallen wounded on a hill under constant machine-gun and shell fire. While they were carrying him back on a litter he was again wounded and the litter was struck twice by machine-gun bullets, but they succeeded in carrying him back to safety, thereby saving his life. Company K, 9th Infantry Regiment, 2d Division, A.E.F. The Distinguished Service Cross is presented to Oscar H. Ryan, Corporal, U.S. Army, for extraordinary heroism in action near Faubourg, France, November 8, 1918, and at Villemontry, France, November 10, 1918. On November 8 Corporal Ryan went on a patrol through heavy machine-gun and artillery fire and returned with valuable information of the enemy. On November 10 he remained on post in a building after half of it had been demolished by shell fire and after being relieved of this duty helped to dig men from the debris of other houses which had been destroyed by the shells. Company I, 60th Infantry Regiment, 5th Division, A.E.F. The Distinguished Service Cross is presented to Max Schumacher, Private, U.S. Army, for extraordinary heroism in action at Clery-le- Petit, France, November 5, 1918. When the advance of his company was held up by enemy machine-gun fire, Private Schumacher, with his platoon commander and another soldier, advanced in front of the line and attacked a machine-gun nest, killing two gunners and taking eight prisoners, thereby enabling the company to advance and establish a brigade bridgehead. The Distinguished Service Cross is presented to Lonnie O. Shoemaker, Corporal, U.S. Army, for extraordinary heroism in action near St. Etienne, France, October 8, 1918. Although he was severely gassed, Corporal Shoemaker continued in the attack until his company had reached its objective and organized the new position, when he was ordered to the rear. The exposure to which he voluntarily submitted resulted in his death. Company B, 321st Machine-Gun Battalion, 82d Division, A.E.F. The Distinguished Service Cross is presented to Alfred R. Simpson, Private, U.S. Army, for extraordinary heroism in action near Somme-Py, France, October 12, 1918. While his company was covering with machine-gun fire a temporary withdrawal of the infantry, before a hostile counterattack, Private Simpson secured an abandoned German machine gun and operated it until his own company, as well as the infantry, had returned safely. He remained at his post until his ammunition was exhausted and was the last one to leave the position. Through his bravery and skill the advance of the enemy was checked, and our own forces were able to organize a fresh counter dash attack. The Distinguished Service Cross is presented to Ethan A. Simpson, Captain, U.S. Army, for extraordinary heroism in action east of St. Etienne-a- Arnes, France, October 8, 1918. While leading his company during the attack on the morning of October 8, 1918, Captain Simpson was severely wounded, but refused to be evacuated until his senior lieutenant had been sent to him in order that he could explain the tactical situation and turn over the command of his company. Although suffering intense pain, Captain Simpson endeavored to conceal the seriousness of his wounds, thereby displaying extraordinary heroism and devotion to duty which were an inspiration to the men of his company. Machine-Gun Company, 357th Infantry Regiment, 90th Division, A.E.F. The Distinguished Service Cross is presented to Joseph M. Simpson, Captain, U.S. Army, for extraordinary heroism in action near Foret Vencheres, France, September 14, 1918. Captain Simpson took command of a platoon that had become separated from its command, reorganized it, and showed marked personal courage in leading it forward under heavy fire. He called for volunteers and then led them in an attack upon a machine-gun nest that had been holding up our advance. With two men, he charged the nest, captured the gun, and killed the crew. Machine-Gun Company, 30th Infantry Regiment, 3d Division, A.E.F. The Distinguished Service Cross is presented to Lowa L. Singleton, Private, U.S. Army, for extraordinary heroism in action in the Meuse-Argonne offensive, France, October 15 & 18, 1918. On October 15, though severely wounded, Private Singleton refused to be evacuated and continued to perform his duties as platoon runner under difficult and dangerous conditions. On October 18 he exposed himself to heavy machine-gun and artillery fire in order to carry water to other members of his platoon, in the performance of which task he was mortally wounded. Company C, 9th Infantry Regiment, 2d Division, A.E.F. The Distinguished Service Cross is presented to Ozro L. Sloan, Private, U.S. Army, for extraordinary heroism in action near Thiaucourt, France, September 12, 1918. When his platoon was under shell fire and threatened by an enemy counterattack, Private Sloan collected in the vicinity a number of soldiers separated from their organizations and led them to reinforce his platoon in the first line. While so engaged he was seriously wounded, but continued on duty with his platoon until completely exhausted. 166th Infantry Regiment, 42d Division, A.E.F. The Distinguished Service Cross is presented to Joseph W. Smith, First Lieutenant, U.S. Army, for extraordinary heroism in action near St. Baussant, northeast of St. Mihiel, France, September 12, 1918. Finding that his platoon would be under heavy fire of enemy machine-guns while crossing the Rupt de Mad, Lieutenant Smith, rather than permit the advance to be delayed, unhesitatingly plunged into the stream, crossed it under heavy fire, ascertained the exact location of the enemy, brought his platoon through the river by a protected route, and with it flanked and captured six machine-guns and 19 prisoners. Company D, 2d Machine-Gun Battalion, 1st Division, A.E.F. The Distinguished Service Cross is presented to William K. Smith, Sergeant, U.S. Army, for extraordinary heroism in action near Croix Le Perre, France, July 18, 1918. After his platoon commander had become a causality and all the machine-guns of his section had been put out of action by shell fire, Sergeant Smith collected the few remaining men of his section, armed them with rifles and pistols and voluntarily led them against an enemy machine-gun nest, which was checking the advance of the battalion. Despite intense machine-gun and shell fire, he made a flank attack on the nest and reduced it, killing or capturing 12 of the enemy. His marked courage and quick initiative enabled the battalion to resume its advance. Company K, 7th Infantry Regiment, 3d Division, A.E.F. The Distinguished Service Cross is presented to Lewis G. Spangler, Private, U.S. Army, for extraordinary heroism in action near Fossoy, France, July 15, 1918. During the intense shelling by the enemy just prior to their offensive of July 15, Private Spangler volunteered and carried a message through the heavy fire and returned with an answer. 6th Infantry Regiment, 5th Division, A.E.F. The Distinguished Service Cross is presented to Gordon C. Stapleton, Second Lieutenant, U.S. Army, for extraordinary heroism in action near Vilosnes, France, November 6, 1918. Entering Vilosnes with a patrol, Lieutenant Stapleton encountered heavy enemy machine-gun fire. He attacked and killed four Germans, took four prisoners and forced those remaining to take shelter in a trench. Although greatly outnumbered he held his position, while the French crossed the River Meuse and took many prisoners. Company F, 107th Infantry Regiment, 27th Division, A.E.F. The Distinguished Service Cross is presented to Bernard A. Stegar, Private, U.S. Army, for extraordinary heroism in action near St. Thibaut, France, October, 18, 1918. When a comrade was severely wounded by machine- gun fire, Private Stegar went to his rescue, crossing open spaces subjected to intense fire by the enemy. He was wounded as he advanced, but he continued forward and reached the side of his wounded comrade, when he was again hit by a machine-gun bullet and instantly killed. Company G, 107th Infantry Regiment, 27th Division, A.E.F. The Distinguished Service Cross is presented to Alpheus E. Stewart, Private, U.S. Army, for extraordinary heroism in action east of Ronssoy, France, September 29, 1918. Private Stewart, having been wounded in the head, advanced with fearless disregard for his own personal safety against an enemy machine-gun nest and succeeded in putting it out of action by bombing the gunners. He was killed immediately thereafter by enemy machine-gun fire. Section No. 647, Ambulance Service, A.E.F. The Distinguished Service Cross is presented to Jack R. Swain, Private, U.S. Army, for extraordinary heroism in action near Beaumont, France, on June 19,1918. Private Swain went to the rescue of wounded men who were exposed to shell fire as a result of an accident to their ambulance. Being able to approach only to within 300 yards of the wrecked car on the road, he took a stretcher and crawled along a ditch to reach them. He then returned and recovered the body of a third man who had been killed in the accident. Headquarters Company, 9th Infantry Regiment, 2d Division, A.E.F. The Distinguished Service Cross is presented to Carl M. Tawater, Sergeant, U.S. Army, for extraordinary heroism in action near Landres-et-St. Georges, France, November 1, 1918. Just as his platoon went over the top Sergeant Tawater and several other soldiers were wounded by a shell which exploded near them. After seeing that the other wounded men were properly cared for, he organized the rest of his platoon and rejoined his unit, remaining on duty all day with his Stokes Mortar Section in spite of a painful wound in the foot. 9th Infantry Regiment, 2d Division, A.E.F. The Distinguished Service Cross is presented to John L. Taylor, Captain, U.S. Army, for extraordinary heroism in action near Soissons, France, July 18, 1918. Captain Taylor assumed command of his battalion upon the death of his major and continued to lead the advance under heavy artillery and machine-gun fire, refusing to leave until he had been wounded five times. His example was an inspiration to all near him, and an important factor in the successful attack made by his regiment. 151st Field Artillery, 42d Division, A.E.F. The Distinguished Service Cross is presented to Alexander W. Terrell, Second Lieutenant, U.S. Army, for extraordinary heroism in action near Pexonne, France, on March 5, 1918. Second Lieutenant Terrell showed unusual courage in assisting to direct the operations of Battery C, 151st Field Artillery, when that organization was under particularly accurate artillery bombardment. Although wounded himself, he refused first aid and continued on duty until all of the wounded soldiers of the command had been treated. Company B, 360th Infantry Regiment, 90th Division, A.E.F. The Distinguished Service Cross is presented to Louis H. Votaw, Corporal, U.S. Army, for extraordinary heroism in action in the Bois-le-Pretre, France, September 12, 1918. Although he was wounded in the body early in the action and later received another wound in the head, Corporal Votaw continued at his post as squad leader until the action was over and then went to the rear only upon orders from his platoon commander. Company H, 142d Infantry Regiment, 36th Division, A.E.F. The Distinguished Service Cross is presented to Bergen X. Waldrop, Sergeant, U.S. Army, for extraordinary heroism in action near St. Etienne, France, October 8, 1918. While leading his platoon in an advance in the face of heavy machine-gun and shell fire, Sergeant Waldrop was wounded, but refused to go to the rear, continuing his advance until the objectives had been attained. Salvage Squadron No. 1, Quartermaster Corps, A.E.F. The Distinguished Service Cross is presented to Willis J. Walker, Private First Class, U.S. Army, for extraordinary heroism in action in connection with military operations against an armed enemy near Bezu St. Germain, France, September 7, 1918. When fire broke out in a wood where a salvage detachment was encamped, seriously endangering the lives of 200 men because of its proximity to a pile of salvaged German high explosives 155-millimeter shells, Private First Class Walker and Sergeant Afton E. Wheeler voluntarily ran to the scene of the fire and attempted to extinguish the flames fully aware of the grave danger to themselves. They fought the fire with blankets and sticks, but the fire quickly spread to the shells. Both men were killed by the explosion which followed. 18th Infantry Regiment, 1st Division, A.E.F. The Distinguished Service Cross is presented to Charles F. Warren, First Lieutenant, U.S. Army, for extraordinary heroism in action near Exermont, France, October 5, 1918. Lieutenant Warren led his platoon forward through artillery and machine-gun fire to rescue six men who had been cut off from our lines by the enemy. While crossing an open space his platoon was fired upon by enemy machine guns. Lieutenant Warren advanced ahead of his platoon, calling to his men “Follow me,” until he fell wounded by a machine-gun bullet. 315th Engineers, 90th Division, A.E.F. The Distinguished Service Cross is presented to Edward R. Warren, First Lieutenant, U.S. Army, for extraordinary heroism in action near Fey-en- Haye, France, September 12, 1918. First Lieutenant Warren was in command of a platoon of engineers and went over the top with the second wave of infantry. When the first wave was halted by severe machine-gun and shell fire early in action and all its officers killed or disabled, he led his men up to the first wave, reorganized the remaining effectives and led them across a valley and up a hill through severe flanking fire from German machine-guns. He was knocked down by the explosion of a shell, but, undaunted by murderous fire from the front and both flanks, he continued to lead his men on toward their objectives until he was shot down by a machine gun. The Distinguished Service Cross is presented to Rufus Warren, Private First Class, U.S. Army, for extraordinary heroism in action near Bantheville, France, November 1, 1918. Although wounded in the leg and hand, Private Warren insisted on advancing with his unit. In addition to his equipment, he carried a trench mortar barrel, the extra weight proving a severe strain on account of his wounds. After receiving two more wounds from shrapnel, he crawled alone to the dressing station, refusing proffered help. The Distinguished Service Cross is presented to John Samuel Weimer, Private, U.S. Army, for extraordinary heroism in action near the Vesle River, France, August 10, 1918. While on outpost duty, Private Weimer learned that a soldier from another organization was lying wounded in a shell hole 200 yards away. With another member of his squad Private Weimer voluntarily went through machine-gun and sniper fire, and carried the wounded man to shelter. The Distinguished Service Cross is presented to Herbert W. Whisenant, Second Lieutenant, U.S. Army, for extraordinary heroism in action near Soissons, France, July 18, 1918. While advancing with his platoon, Lieutenant Whisenant, after he was so severely wounded that he was unable to continue so encouraged and inspired his men that they won a decided victory and captured many men and guns. His wound resulted in the loss of a leg. The Distinguished Service Cross is presented to Paul Willis, Sergeant, U.S. Army, for extraordinary heroism in action near St. Etienne, France, October 8, 1918. Upon the death of his platoon commander, Sergeant Willis took command of the platoon and led his men in an attack against the enemy. Although wounded several times, he continued to lead his men until killed by machine-gun fire. The Distinguished Service Cross is presented to William A. Worthen, Mechanic, U.S. Army, for extraordinary heroism in action near Tuilerie Farm, France, October 3, 1918, and at Mouzon, France, November 7, 1918. On October 3 Mechanic Worthen was assigned to duty as a runner after he had requested to go into action with his company instead of remaining in the rear. He showed exceptional bravery while carrying messages through heavy machine-gun and artillery fire, and on November 7 he maintained communication with battalion headquarters when the enemy were endeavoring to cut off his company by machine-gun and shell fire. Company D, 321st Machine-Gun Battalion, 82d Division, A.E.F. The Distinguished Service Cross is presented to Louis Yaeger, Private, U.S. Army, for extraordinary heroism in action near Pont-a-Mousson, France, September 12, 1918. Private Yaeger, with his brother, Corporal Roy Yaeger, remained at an advanced position in the face of heavy machine-gun and rifle fire from the enemy and, by effective use of their machine-gun and pistols, covered the withdrawal of the infantry, inflicting serious losses on the enemy and refusing to retire until they were ordered to do so. The Distinguished Service Cross is presented to Roy Yaeger, Corporal, U.S. Army, for extraordinary heroism in action near Pont-a-Mousson, France, September 12, 1918. Corporal Yaeger, with his brother, Private Louis Yaeger, remained at an advanced position in the face of heavy machine-gun fire and rifle fire from the enemy, and, by effective use of their machine-gun and pistols, covered the withdrawal of the infantry, inflicting serious losses on the enemy and refusing to retire until ordered to do so. 363d Infantry Regiment, 91st Division, A.E.F. The Distinguished Service Cross is presented to Ernest M. Yantis, First Lieutenant, U.S. Army, for extraordinary heroism in action near Tronsol Farm, France, September 30, 1918. Leading his platoon as a combat patrol 500 yards ahead of the front line, under intense shell and machine-gun fire, Lieutenant Yantis was wounded three times, but remained on duty for more than an hour until relieved. He then refused to leave until the new officer had been fully informed as to his disposition and that of the enemy. Department of Defense. Army Distinguished Service Cross Recipients. https://valor.defense.gov/Recipients/Army-Distinguished-Service-Cross-Recipients/. Accessed 6/30/18. HomeOfHeroes.com. 2115 West 13th Street – Pueblo, CO 81003. http://www.homeofheroes.com/members/02_DSC/citatons/01_wwi_dsc/dsc_05wwi_Army_S.html. Accessed 1/17/18. Traces of War. 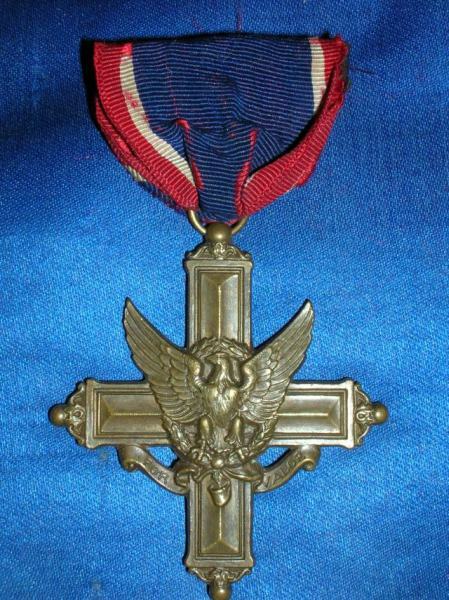 https://www.tracesofwar.com/awards/236/Distinguished-Service-Cross-DSC.htm. Accessed 6/30/18. Texas World War One Honor Roll has these brave soldiers who were killed in action remembered along with 5,000 more Texas WW1 casualties. Lest We Forget. https://bit.ly/txww1hr The Fallen. Thank you so much for this information. I found one from here in Shelby County, Texas that I wasn’t aware of. Made my day.